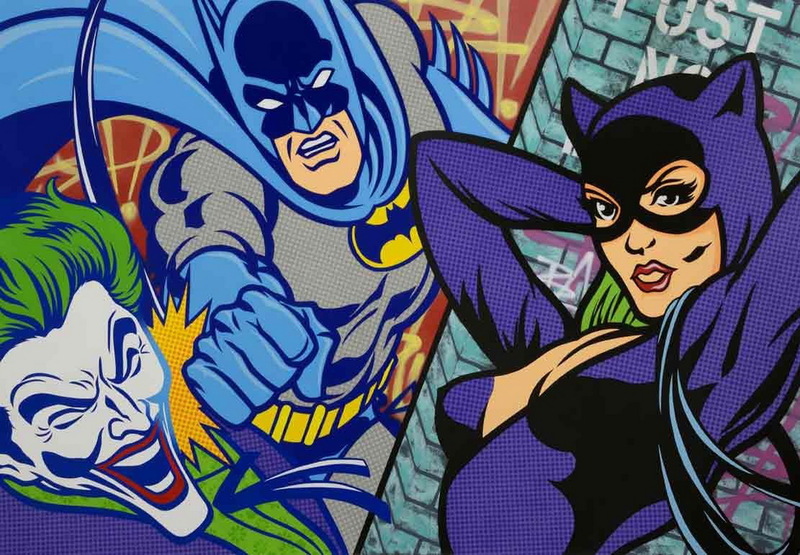 Ever since the 1960s and masterpieces of the Pop Art movement, such as Lichtenstein‘s Drowning Girl and Warhol‘s Superman, superheroes have been a significant and irreplaceable part of Contemporary and Urban art. Visual narratives featuring characters endowed with moral and physical powers which reference classical mythology and ancient heroes and villains, evolved into perfect subjects for further artistic development. 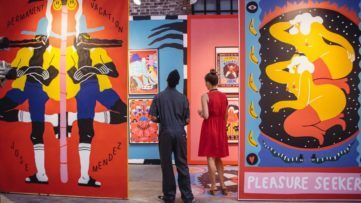 The following list of ten superhero-themed artworks clearly shows an immense inspirational potential of masked vigilantes in possession of magical superpowers, who continue to fight for justice and peace on canvases and walls created by both emerging and legendary urban artists. As both art and cultural phenomenon, Iron-Man, Superman, Wonder Woman, Hulk and Wolverine are being continuously reinvented, retouched, defaced, sprayed and resprayed over, proving how far comic books and their characters have gone since their “invention” in the 19th century. Edited by Charles Hatfield, The Superhero Reader is a book that combines modern academic essays with book excerpts and commentaries on superhero phenomenon since the early days of superhero comics. The book is an excellent introduction to the specific superhero comic book genre, which has been dominating the comic book market for the last fifty years. However, the study doesn’t end here and it goes beyond a single branch of comic book production, examining cultural, historical, and aesthetic significance of superheroes in Western culture, as well as lives of those iconic characters across various media, from film to video games and other artistic genres. The Superhero Reader is a great reading material for those who want to discover the world of superheroes in relation to popular culture and ways in which superheroes connect with larger cultural context. Simone Bianchi, is a praised Italian comic-book artist, widely recognized for his superbly rendered images produced for Marvel Comics, including superhero characters such as Wolverine, X-Men, Spiderman, Fantastic Four and New Avengers, which he masterfully enlivens with moral purpose and evil intention. 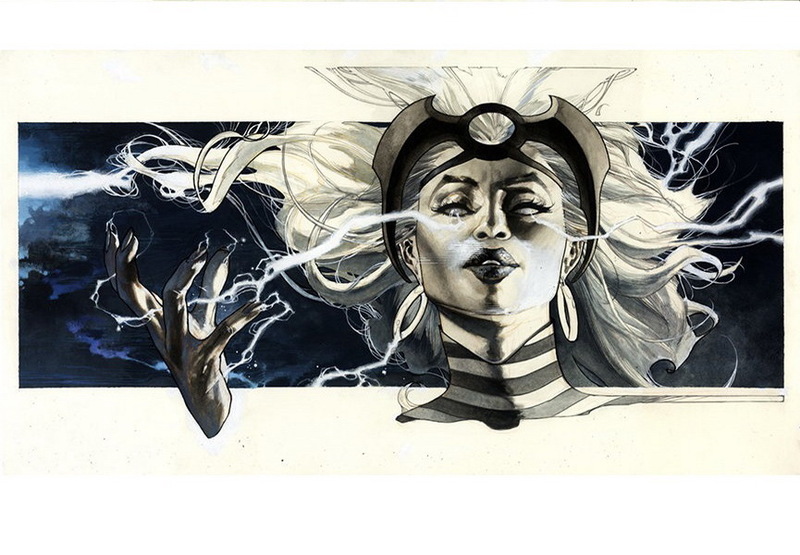 Among numerous iconic images presented at the critically acclaimed Villains and Superheroes: Works on Paper exhibition, there is the exceptional rendition of Storm, X-Men mutant superhero with an ability to control the weather. The mesmerizing piece, executed in pencil, ink and acrylic, and 29.7 x 53.3 centimeters in size, is a brilliant and deftly artwork of unforgettable figurative language that confirms Bianchi’s well deserved place in the always changing history of contemporary art. This artist really brings something new to the recurring theme of Heores vs Villains. One of America’s most famous and most expensive living artist, Jeff Koons, is widely known as an ambitious perfectionist, and the fact that it took him eight years to finish his Hulk (Friends) sculpture is a perfect example of that. Precision-machined, almost two meters tall bronze sculpture of Hulk, inspired by an inflatable of the popular comic book hero, is a part of Koons’ ongoing series Hulk Elvis, he started working on more than a decade ago. 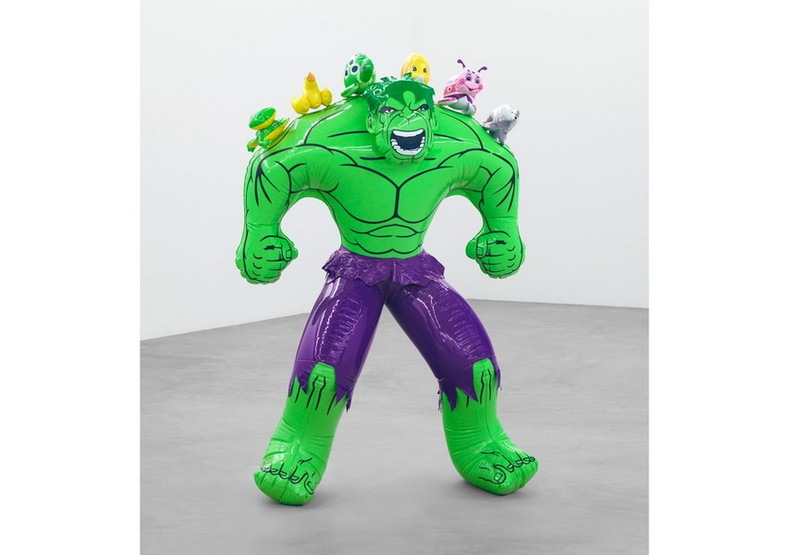 The sculpture, which polychromed finish perfectly mimics the gloss of plastic inflatables on which audience can reflect upon, pairs the Hulk superhero with an incongruous crew of inflatable toy animals, and looks light and airy, even though it actually weighs almost a ton. The iconic piece, rich in associations and immaculate shapes, is a spectacular and unrivaled piece of superhero themed work of art. Anthony Lister, Brisbane born artist extraordinaire and pioneer of the stencil and Street Art movement in his hometown, is widely considered as one of Australia’s finest contemporary artists. He is best known for his amazing paintings, drawings and installations which boldly reinterpret pop culture symbols and drip with sophisticated aesthetics encompassing the avant-garde of modern society. Exploring the innate sense of chaos and false sense of security existing in modern society, Lister’s work cleverly questions the juxtaposition of adult and underage heroes, leaving an inescapable question mark hanging above the heads of a generation. His themes of subverted pop icons often show power tripping superheroes indulging in louche behavior. 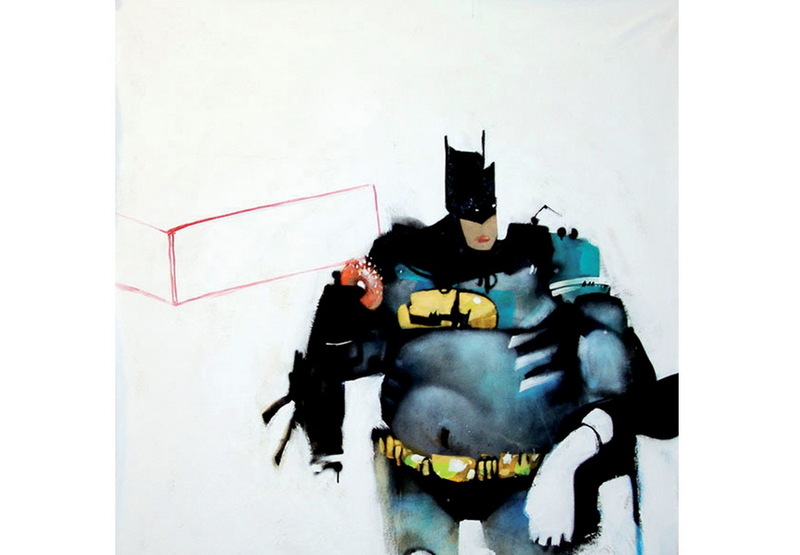 Such is his Fat Batman, captivating work of art that shows an aged Gotham City crime fighter rendered in unusual shape and size, a perverted superhero eating a sugarcoated donut. One of the world’s best known urban artists and so-called Godfather of Graffiti, SEEN is probably the first artist who comes to mind when discussing superhero themed imagery. 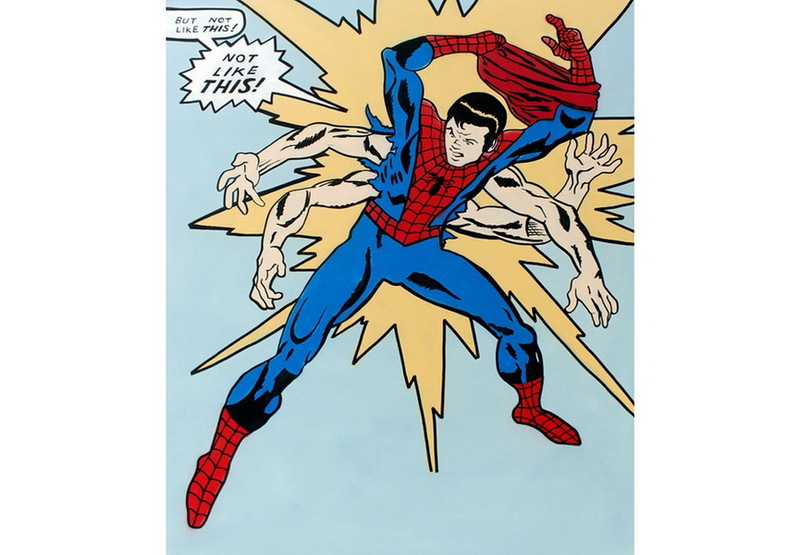 His deep fascination with comic-book heroes and cartoons, which dates back to his childhood years of the early 1970s, crucially influenced the birth of his instantly recognizable iconography of predominantly cartoon and superhero inspired works. Depicting characteristic gestures of both superheroes and showing their overwhelming expressions of anger or pain, Red Hulk & Wolverine is SEEN’s awesome piece from 2014 which features all of the signature elements usually seen in his art. 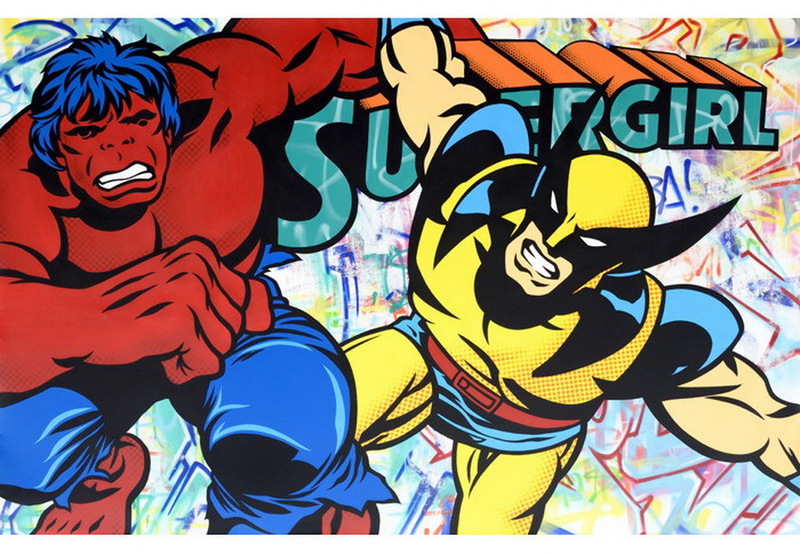 With two famous superheroes stenciled in front of a graffiti backdrop, SEEN’s piece demonstrates his exceptional pop artistic vision, which brings back to mind Lichtenstein’s classic renderings of similar themes. Adam Brazier is an emerging urban artist who has been rapidly building an international reputation as one of the leading super-realist portrait painters working with aerosol, continuously pushing the medium to its limits with his breath-taking interpretations of pop culture icons. 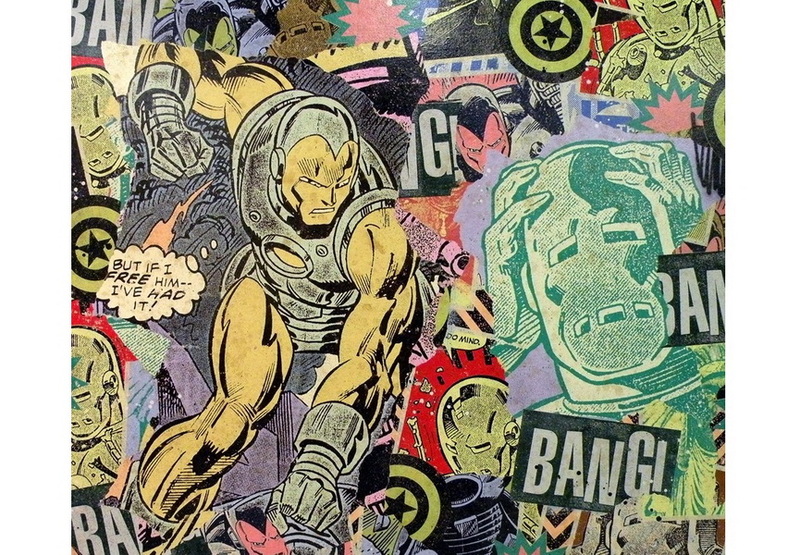 His Ironman is an extraordinary piece, 90 x 120 centimeters in dimension, presenting a cutting-edge depiction of famed and intimidatingly looking superhero, spraypainted over a collage of comics, which is a recurring theme in Brazier’s work. 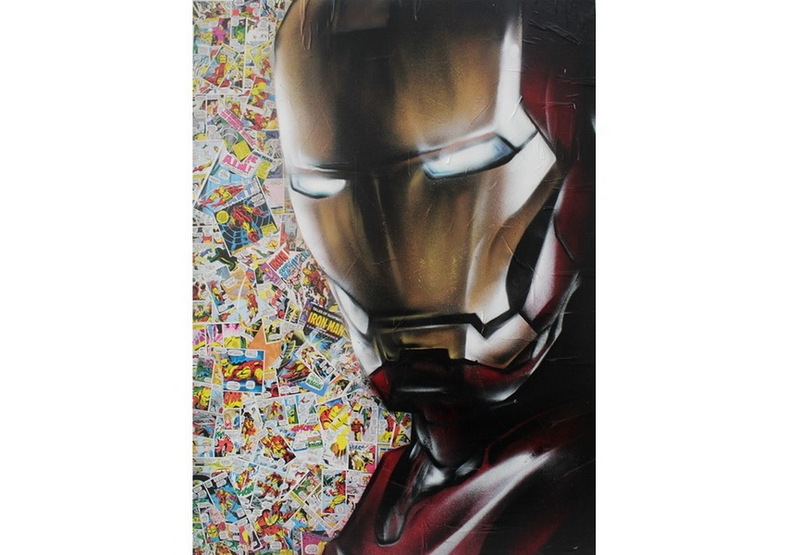 Paying an homage to his childhood favorite Marvel Comics character, Adam Brazier added some fresh urban art twists to Iron Man, an ingenious engineer turned superhero and founding member of the Avengers team, who has bravely stood as an invincible defence against corporate crime, terrorism and communism since 1960s. This ultra-modern piece of art clearly shows that with great superheroes, comes great art created in their celebration. 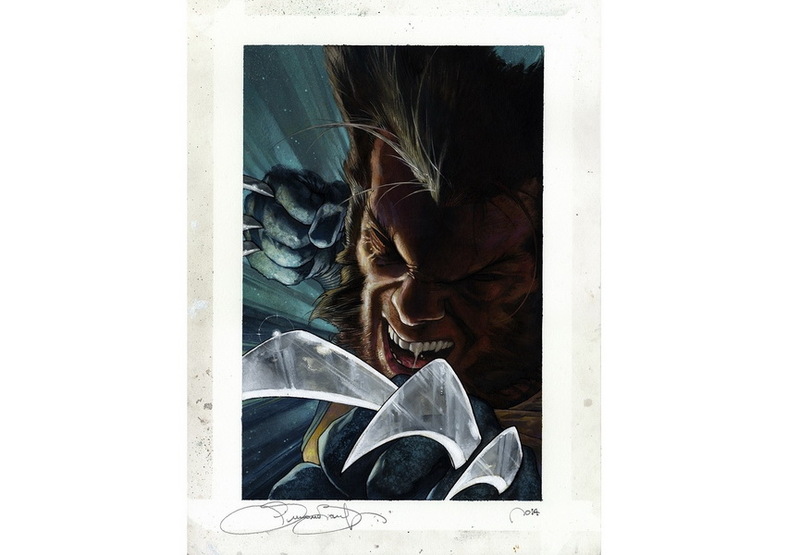 Wolverine is yet another awesome piece of superhero themed artwork created by highly talented comic-book artist Simone Bianchi which is currently on view as part of his Villains and Superheroes exhibition at the Danese/Corey Gallery. Bianchi’s rendition of Marvel Comics’ superhero is a captivating visual frenzy, featuring a super tight portrait of the indestructible X-Man, all washed in ink and decorated with idiosyncratic design elements that successfully maximize its dramatic effect. This mind-blowing piece is intimidating and, at the same time beautiful, while depicting the monstrous and ultra-violent energy of Wolverine. Horrific at first, Bianchi’s top-notch portrait of clawed mutant whose skeleton was surgically laced with adamantium, elevates his character to epic status and represents an unforgettable image that transcends the formal conventions of the comic book genre. Greg Gossel is a talented American visual artist with a strong background in design, whose work is often described as a captivating combination of Roy Lichtenstein and Shepard Fairey. Gossel’s amazing piece titled I’ve Had It! 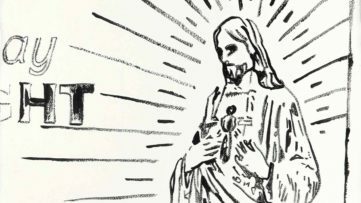 is a great example of his immense talent and extraordinary aesthetics, presenting an expressive interplay of words and images vs gestures, created through the process of vintage comic book reconstruction. This mixed-media canvas, 76″ X 64″ in dimensions, is a multi-layered work that resembles decaying billboards and perfectly illustrates Greg Gossel’s amazing ability to articulate fragments of pop culture images with the dynamic references of contemporary narrative. By fragmenting iconic characters and reinstalling them within a chaotic world of colors and patterns created with the use of silkscreen ink, spray paint and collage, Gossel reveals a different side of what once were invincible superheroes. Another superhero themed artwork by Anthony Lister featured on our list is his extraordinary piece Super Natural Disorder #2, which is part of his latest collection of work titled Power Tripping, and which deals with subjects such as governmental control of the people and authoritarian regimes. 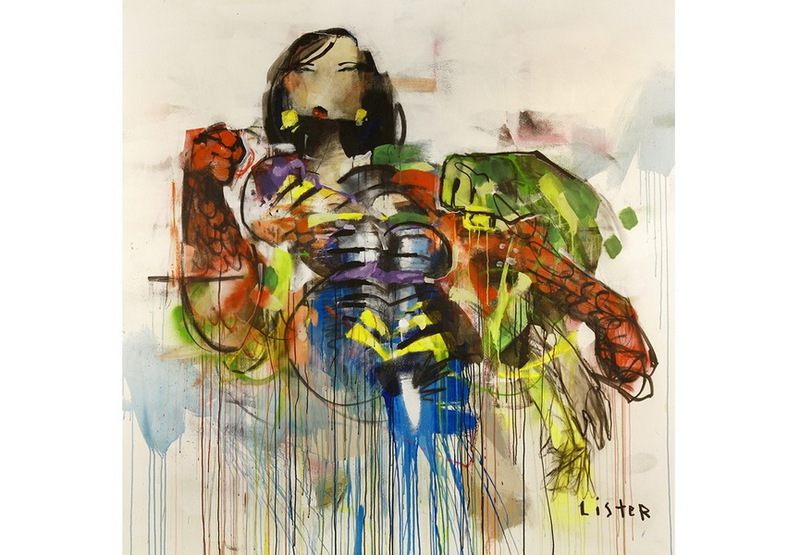 With a loose, visceral energy, Lister’s work, deeply rooted in expressionism, is full of movement and energy, showing his subject conveying a sense of both grace and grit, and reflecting a kind of imbalance of power in its extraordinary presentation as grotesque comic book hero. Combining bold accent colors and blunt brushstrokes with drippy layers of ink, oil and spray paint, this comic-inspired superhero (or villain) is abstracted by a raw, gestural approach of Lester’s adventure painting style, an intriguing experimental process which embraces accidents, drips, splodges, expressionist brushwork and spray-paint, resulting in a truly mesmerizing visual treat of what may be an inner struggle of the hero vs the villain. Benjamin Badbones is an established street artist who has been painting graffiti since 1999. 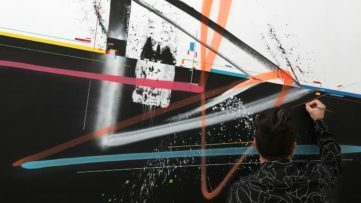 He is a highly versatile artist who uses spray paint to brings street flair to his top-notch artworks that include elements of repetition, iconography and pop culture. Benjamin Badbones’ mixed media piece titled Not Like This addresses the well-known figure of Spider-Man, one of the most popular and commercially successful superheroes, Marvel Comics’ flagship character and company mascot. The artwork, 90 x 120 centimeters in dimensions, depicts a freelance photographer/superhero cursed by the agility and proportionate strength of a spider, and shows us that with great power there must also come, not only a great responsibility, but great trouble. To wrap up our list of cutting-edge superhero themed artworks, we once again turn to the extraordinary talents of New York based street art legend SEEN. Wonder Woman, known to her people as Princess Diana of Themyscira, is a DC Comics superhero and a feminist icon, a warrior princess of the Amazons gifted with a wide range of superhuman powers and superior combat skills. Among Wonder Woman’s extensive arsenal of weapons, which includes the Lasso of Truth and deceiving tiara which serves as a deadly projectile, she is also equipped with a pair of indestructible bracelets, which are the main theme of SEEN’s amazing piece titled Wonder Woman Bracelets #1. Also known as the Bracelets of Submission, they are a pair of indestructible metal cuffs she uses as forearm guards able to absorb the impact of incoming attacks and long falls. 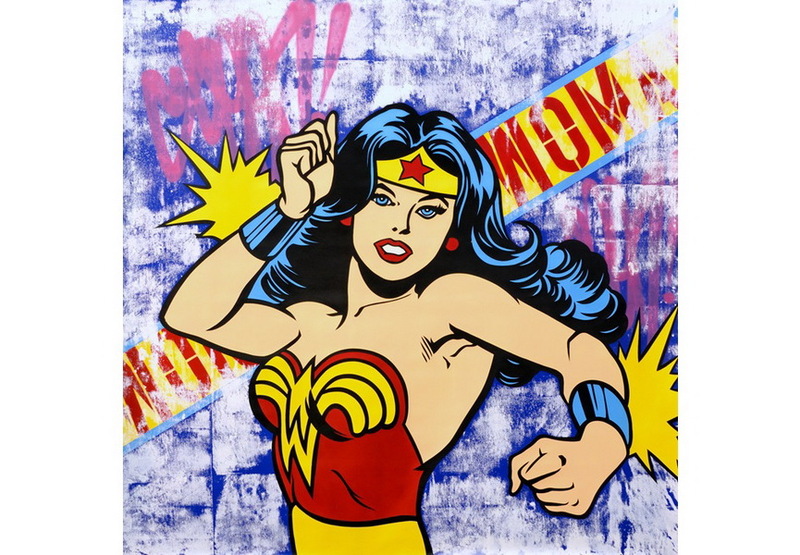 SEEN’s stenciled large scale canvas, is a wonderful depiction of a superheroine fighting for justice, love, peace, and sexual equality, while beating up colorful villains and monsters. KAPOW!